This season, don’t be afraid to get a little glamorous and wrap with shiny metallics, design with diamonds, and accent using glitter. Let us show you how! Nothing says glam like dramatic, shiny gift wrap. If you are looking to make a statement with your gift, we recommend this contemporary Silver Trees Gift Wrap. Its icy cool silver color scheme, reflective metallic detail, and modern Christmas tree motif is a great way to bring on the glam and create a show-stopping present. 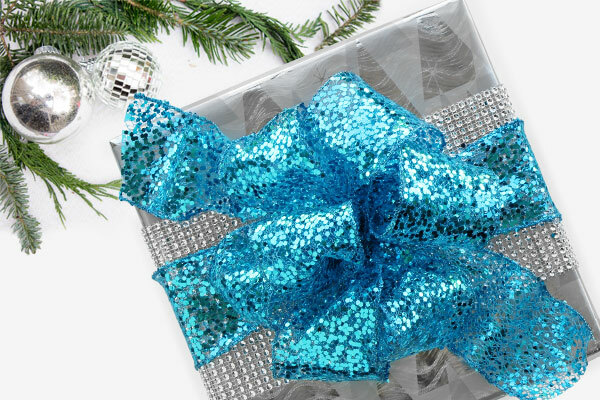 FYI: For more metallic options, check out our Metallic Wrapping Paper Collection. If you’re going to go the extra mile by making or purchasing a glamorous gift, then don’t hesitate to pull out all the stops. Now is the perfect time to layer on the glitz and break out your faux diamond embellishments. A faux diamond wrap is a lush way to add eye-catching drama to a seemingly simple gift. For this present, we used a wide faux jewel diamond wrap in silver. Each diamond is made of multifaced plastic and molded to mimic the sparkle and glisten of a real jewel. It is then woven together to form an easy to work with a wrap that could be layered onto any material. It’s the perfect way to add opulence to any gift. FYI: If you’re want to embellish even more with jewels, visit our Jewels & Rhinestone Collection. Finally, top your gift off with sparkly bow accents. There is nothing more astonishing than a voluminous bow that glimmers. For this gift, we use the 3D Dots Metallic Ribbon. The 3D Dots Metallic Ribbon provides just the right amount of over-the-top shimmer that we need to finish our glamorous gift. Its wired edges make it easy to shape and design extravagant bows and loops. FYI: Explore our Glitter Ribbon Collection for ribbons that sparkle. What types of presents are you wrapping up this season? Show us using the social tag #mypapermart. If you loved these tips and want to see more, stay tuned. We’re looking forward to making more DIY craft videos, product features, and tips for small businesses!